Yes, it's true - every now and then I like to report good news (here, for example). Mainly I like to do this in order ro reaffirm the truth that such a thing as "good news" does indeed exist in the world. 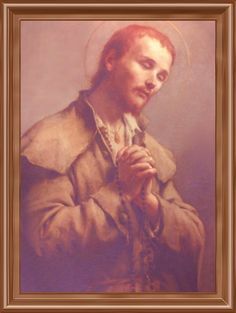 The good news I am about to relate occured in my very own parish just this month. 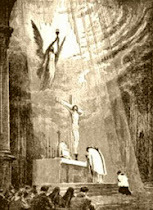 Our parish has recently begun offering the Extraordinary Form of the Mass once per month. Normally our Mass times are 8:00 and 10:30, but on the one Sunday a month when the EF is said it is done as a third Mass offered at 12:30. 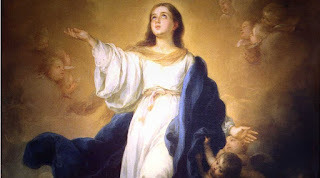 Well, this past month I was attending the monthly TLM and was standing back in the vestibule with my crying, fussing child (where I spend most of my Masses). Sometime during the consecration, the old church doors creaked open and an elderly couple walked in. They apparently did not know there was a Mass going on (the church is normally empty at that time of day) and were quite surprised to see a Traditional Latin Mass being said. They kind of stood there in dumb disbelief for a minute before the old woman approached me and asked, "Does this happen every week at this time?" I explained to her that it was a monthly thing, at this time at least. She and her husband told me they would definitely be back every month to attend it. and that, had they known it was going on, would have rather come to that Mass than the one they already went to that day. She then said to me, "I haven't seen the traditional Mass in years. It brings tears to my eyes." Visibly moved, her husband and her stayed on for a few moments longer in silent piety before departing. It brought tears to my eyes, too. This incident reminded me of the elderly and the way they are thrown about as an argument by those for and against the Traditional Mass. For those who wish the Traditional Mass would just go away, the Extraordinary Form is generally seen as a bit of nostalgia for old people who cannot get over their "attachment" to an antique whose time is over. 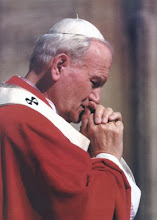 Thus, for progressives, it is only for the sake of some of these pre-Vatican II elderly who stubbornly refuse to die that the Traditional Mass remains in existence; presumably, once this generation dies off, there will be no more of these obnoxious old people to "remain attached" to it and it will therefore disappear. If we go over to the other side, to the Traditionalist camp and those who are in favor of the Extraordinary Form in varying degrees, we will see not infrequently the charge made that today's elderly are those most against the old Mass. The elderly of today were the adult generation of the 1960's who, in many cases, welcomed the tragic dissolution of our tradition with open arms and are now fighting to make sure that they pass on the decadent spirit of the sixties before they kick the bucket. Furthermore, it is often said that Extraordinary Form Masses are usually attended by a higher proportion of young persons, suggesting that it must be in some way true that the elderly do not appreciate the old Mass as much as the young. Ultimately, these are both stereotypes: the elderly as crusty reactionaries nostalgically clinging to "their" old Mass and the elderly as aged, geriatric progressives still fighting on the cusp of death to modernize the Church. As stereotypes, both of these generalizations can be shown to be false in a thousand particulars, but are paradoxically true as generalizations. It is definitely the case that there are elderly people whose taste for the old Mass is of a nostalgic, aesthetic nature. It is also the case that I have run across more than a few elderly people who are as radical as any progressive of the 1960's and who would rather go to a Protestant service than see a return of traditional implements like communion rails. Both extremes exist within the elderly community, just as they do in any other age demographic. "I know quite well that, to you as to me, the Church which once felt like a refuge, now often feels like a trap. There is nowhere else to go! 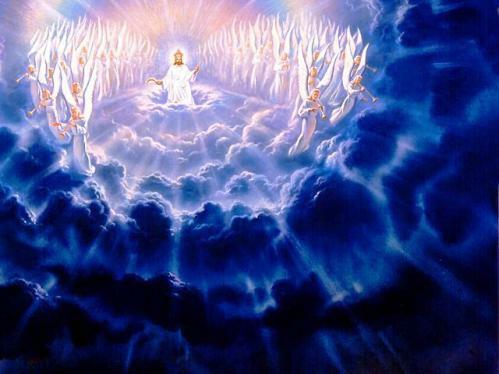 (I wonder if this desperate feeling, the last state of loyalty hanging on, was not, even more often than is actually recorded in the Gospels, felt by Our Lord's followers in His earthly life-time?) 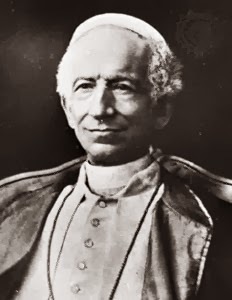 I think there is nothing to do but pray, for the Church, the Vicar of Christ, and for ourselves; and meanwhile to exercise the virtue of loyalty, which indeed only becomes a virtue when one is under pressure to desert it" (Letter 306). What a tragic conundrum to be stuck in for any person to whom the Church has meant as much as it did for Tolkien! Yet this is the conundrum that I think many of the elderly have found themselves in for decades. Perhaps they still wrestle with it; perhaps they long stopped wrestling and have just accepted the status quo, accustoming themselves to mediocrity and modern trends until, like the woman in my story, one day they stumble upon the Traditional Mass somewhere, not in a book or an old black and white film, but being gloriously celebrated before them, alive and vibrant, as if the past forty years had crashed like a wave upon the Rock of the Mass of Ages but receded, leaving the liturgy immaculately preserved, and only in that moment realizing what was truly lost. Perhaps this encounter is something like what the woman in my story experienced when tears welled up in her eyes. Well, the lesson is to not assume that the elderly, or any demographic for that matter, are completely monolithic in their approach to these matters. I see lots of elderly folks at TLMs and also lots of elderly folks who angrily cross their arms whenever my pastor starts praying in Latin. 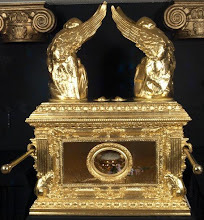 It is good to remember as well that one day we ourselves will be the elderly of another generation's future and in the meantime study the question of the elderly and the TLM a little more in depth. 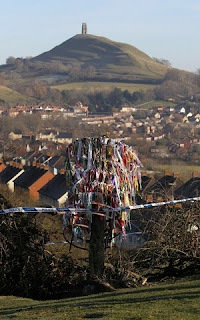 "Legend has it that the rare thorn tree on a hill in southern England had ties to the earliest days of Christianity, and pilgrims often left offerings at its base. In more recent times, local children honored its current incarnation each year by cutting sprigs to place on Queen Elizabeth II's Christmas dining table. "I've just driven past the site, and people are coming out in tears," said Glastonbury Mayor John Coles. 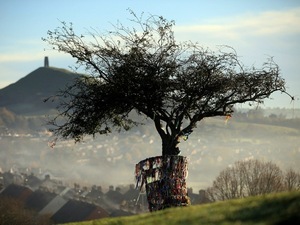 "I've never seen a sadder sight, or a more serious act of vandalism, in my 60 years in Glastonbury." Glastonbury, 125 miles west of London, is best known for its annual rock music festival, which has drawn artists such as Bruce Springsteen since the 1960s. Its mysterious landscape — including the Glastonbury Tor hill, which is believed by some to have magical qualities — has drawn pagan worshippers for many years. "It's a sacred tree," she said. "Not only for the Christian church, but for many other people." Coles said the nighttime attack came between Wednesday and Thursday shortly after he, the local vicar and schoolchildren participated in the annual sprig cutting for the queen's Christmas table. The sprig is sometimes visible during her televised Christmas broadcast to the Commonwealth — and the queen always sends a letter of thanks, he said. Coles believes that someone who saw the sprig ceremony on local television or who witnessed it in person — decided afterward to chop down the tree, which did not have any security cameras nearby. "It could be an anti-monarchist, an anti-Christian, or someone who's an atheist," Coles said. "We don't know whether it's one person responsible or a group." Religious tradition holds that the original tree was planted by St. Joseph of Arimathea — the wealthy merchant who volunteered his prepared tomb to Jesus — after he first made landfall in England some 2,000 years ago. The chopped-down tree is thought to be descended from the original. It blooms twice a year — during the Christmas season and again around Easter. "The story goes that Joseph of Arimathea pushed his staff into the ground and pronounced it to be weary — that's why it's known as Wearyall Hill," Coles said. "The tree is said to have grown from the staff. It's something you can't prove or disprove." "You can take the miraculous approach or the pragmatic approach," she said. Local historians said the tree — or one of its ancestors — has been chopped down at least once before, by a soldier using an ax during the 1642-51 English Civil Wars. "It will obviously be deformed, but it will put grafts out next spring," said Tony Kirkham, head of the arboretum at the Royal Botanic Gardens at Kew. "But it will take a long time to make a good tree." "The tree unites everybody in the town," she said. "It's a symbol worldwide. Local people do see this as an attack on Glastonbury." 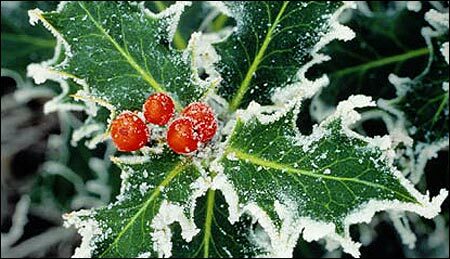 It has become my custom each year during Advent to do a posting on Christmas music; I am happy this year that I am finally able to share one of my favorite Christmas songs of all time, The Holly and the Ivy. I'm sure all of you are familiar with this tune, but I am not referring to the popular version of the song as heard here. There is another version of the song, one that is much more festive and upbeat, and much rarer. I have only heard this version in one place - on an English Christmas CD that I picked up nearly ten years ago. It was sung by the Norwich Cathedral Choir, though there was no mention on the CD of who had written the arrangement. In my last post we looked at the differences between ecclesiastical and classical Latin. In this post we will look at why classical Latin slowly evolved (through many intermediate phases) into ecclesiastical Latin and why we should prefer the use of ecclesiastical Latin in the Church to classical. Classical Latin was never the main form of Latin of the Roman empire. It developed relatively late in the history of the Republic, coming only with the "Graecofication" of Rome that came in the wake of the Punic Wars and the conquest of Greece. This is first detected in the poet Ennius (239-169 BC); Cicero, one of the architects of what became known as "classical" Latin, was schooled in Athens and intentionally brought Greek constructions into the Latin usage, which he considered to stiff and rustic in its native form. I would say the advent of classical Latin can be dated around 100 BC at the earliest, though 50 BC might be more reasonable; it maintained its supremacy only for a brief period, dying with the Republic as the advent of the Prinicpate and the Empire made rhetorical skill less important than imperial patronage in political advancement. It had already lost its supremacy by 100 AD and the advent of the Antonines, during which time Greek received a fresh patronage. As the spoken language continued to develop as the empire became more polygot, a corresponding decline in the importance of rhetoric for political advancement made the constructions of classical Latin obsolete. Once the last vestiges of the Republic faded away, once important positions were filled by imperial appointment and no longer by election, there was no longer a necessity for the would-be politician to be a skilled orator. Fidelity and syncophancy to the emperors became much more important, leading to a general decline in the importance of rhetorical Latin. Couple this with the fact that Trajan, Hadrian and Aurelius, all Spaniards, had a tendency to elevate Greeks to important positions in the imperial court, and we can see why classical Latin waned in importance all throughout the 2nd century. But this was only the case in spoken Latin. As the Church mainly communicated by writing, and as the barbarians were by and large illiterate in the first few generations, the propagation of knowledge and the governance of the Church continued on in the Latin tongue without nearly as much dilution from the Germanic languages as the spoken Latin had suffered. Thus we are left with the reality, by the 6th century, of Church whose official language is one no longer spoken by the people. This form of Latin, to a degree influenced by the balkanization of the empire in its death throes and the developments of the 5 centuries since the time of Augustus, became known as "medieval" or "ecclesiastical" Latin. Unlike the spoken forms of Latin, this eccelsiastical usage was able to endure precisely because it was an administrative language; its spoken usage was also regulated by the liturgical books and sacramentaries, which acted as conservative bulwarks against the same kind of dilution that had turned Gaulish Latin into French. 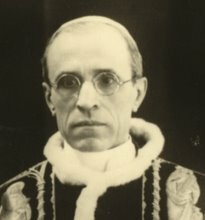 In short, by being wedded to the liturgical and administrative needs of the Catholic Church, ecclesiastical Latin was rendered invulnerable to the same deteriorating influences that had swept away prior forms of Latin, and was thus enabled to endure as the language of the educated for many centuries. We might also point out that nobody has an ear for classical Latin. After century upon century of pronouncing Latin according to the usage of the Middle Ages, the classical pronunciation sounds awkward, artificial and forced.This was put quite well in the most recent issue of Memoria Press' The Classical Teacher in an article about macrons by Cheryl Lowe. In this article, she points out that many ecclesiastical pronunciations of words are so ingrained in our vocabulary that the even classicists do not say them according to the classical pronunciation. For example, according to Lowe, the classical pronunciation of a short a in classical Latin is uh. Thus, the conjugation of amo would be uh-moh, uh-mas, uh-muht. Yet nobody says that; even classicists say ah-mo. Another example is Italia, which in classical would be ee-tuh-lee-ah. Thus, we are left with some words which use the medieval pronunciation just by convention (Magisterium Magi, Italia, etc.) and others which would revert to classical pronunciation, leading to the type of hodge-podge we have in English where letters are pronounced differently depending on the word and usage, making the language much more difficult ot learn. The classical pronunciation actually hinders the comprehension of Latin by students because it is counter-intuitive. Lowe concludes the article by rightly saying, "There is a lot to learn in Latin, and I made the decision long ago that I didn't want an emphasis on the details of a "restored" classical pronunciation that no one has an ear for. It would be an impediment to learning Latin" (The Classical Teacher, Winter 2010, "To Macron or Not to Marcon?" p. 11). If we can incriminate ideas by guilt-by-association, then the classical "restoration" of the late 19th century is condemned as the linguistic branch of the general modernist attack of the period. Just as the modernists wanted a new, critical approach to Scripture study and theology, so they advocated for a "new" approach to the teaching and speaking of Latin. And, just as in the other two cases mentioned above, the modernists pushed for classical pronunciation under the guise of a false archaeologism; the fable was fostered that because classical was closer to the usage of the early church, it was "better", implying that the legitimate developments of the subsequent eighteen centuries were deficient. Of course, this was a fallacy because the Latin of the early church was not classical Latin. 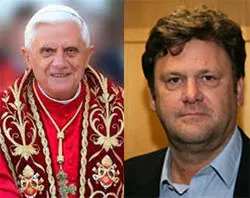 The Latin of the earliest liturgies, those of African churches circa 200 AD, were not classical Latin; indeed, by that time classical Latin had been out of usage for almost a century (we'll reserve for a future post the question of what type of Latin the Fathers did in fact use). This is a post I have been wanting to do for a long time, as it was requested of me by more than one reader; I only apologize that it took so long to get to it! I do encourage readers to let me know of suggestions for posts, since I am always looking for new material. 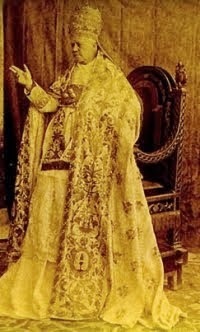 This two-part posts is meant to serve as a basic introduction to the difference between classical and ecclesiastical Latin; in presenting the differences between these two forms of lingua latina we will look at the motives behind the sudden resurgence of the classical pronunciation at the turn of the last century and hopefully demonstrate why Catholics should prefer the ecclesiastical pronunciation to the classical. Classical Latin refers to the Latin language as it was spoken during the time of the Roman Empire. However, right away we are stuck with a reference that is too vague; Rome endured as a regional power for around seven hundred years, give or take a century depending on how you determine when Rome rose and fell. This is a tremendous amount of time in linguistics; think of how different English as spoken in 1300 was different from modern English. To lump all English for the past seven centuries into a single category would be extraordinarily sloppy, and it is no less so when we try to equate "classical Latin" as that which was spoken 'in classical times." It is for this reason that Latin scholars have arbitrarily chosen one single moment in Rome's long history at which to crystallize the development of the language and measure all prior or subsequent developments by it. This moment is the Augustan age, from 31 BC to 17 AD, where Latin literature was (allegedly) at its height. This is the Latin of Cicero and Virgil, the high rhetorical Latin of the Senate and Roman oratory. This Latin came into use following the cultural triumph of the Graecophiles following the Roman victory over Hannibal (centered around the circle of Scipio Aemilianus), was developed by Greek-influenced playwrights like Terence and Ennius and reached its zenith in the prose of Cicero and the poetry of Virgil in the following century. Therefore, classical Latin is most accurately understood to be the form of Latin used over about a hundred and fifty year period during the transition from the Republic to the Empire. Ecclesiastical Latin (or medieval Latin as it is sometimes called) is the Latin language as it was developed in the early medieval period and utilized by the Catholic Church. It is difficult to say when ecclesiastical Latin became the norm in the Church, but I'd say anywhere between 500 and 700; it was definitely the standard form of the language by Carolingian times. This Latin grew out of the so-called "Late Latin" (Latinitas Serior) which was in use from the 3rd to the 6th centuries AD. This ecclesiastical Latin was the language of Anselm, Alcuin and Aquinas, the Latin that was taught int he medieval universities and used at Lateran IV and Trent and which subsequently remained the language of the Church up until the upheaval of the Conciliar period, the sacra lingua of the Roman rite. 1) The dipthong "ae" is pronounced like an English long "i" (I am...) in classical while in ecclesiastical it is a long "a" (aye). 2) In classical Latin, the consonant C is always hard, as in "cat." Thus Cicero is pronounced "keekero." Ecclesiastical Latin makes much broader use of the soft C, as in Regina Caeli, for example. 3) The consonant V in classical Latin has a W sound, so that the imperative Venite (come) would be pronounced "wenite." Caesar's famous "Veni, vidi, vici" would have been pronounced "weni, weedi, weeki." Ecclesiastical Latin has the V pronounced the same as in English (as in the Latin words vita and vox). 4) All vowels in ecclesiastical Latin are long; in classical there are rules for long vowels and short vowels (each vowel has two sounds), traditionally distinguished by a macron symbol (˘). 5) The consonant G in Classical is usually hard (got); in ecclesiastical Latin it is more often pronounced like a "j" (just). 6) Finally, accent marks and macrons determine vowel pronunciation in classical Latin; ecclesiastical Latin does not rely on them nearly as much (in fact, not at all usually). These are the differences in pronunciation. If you were to ask me how scholars are able to know so precisely how men pronounced words over two thousand years ago, I haven't the foggiest. I do not claim that these assertions about classical pronunciation are totally certain, but I am certain that this is what the classicists say about classical Latin pronunciation. Then we have the stylistic differences between the two forms. Classical Latin was the Latin of the elite. It was developed for use in political oratory, rhetoric and the recitation of epic poetry. It was used for official state functions, pagan liturgies and panegyrics. There is a great emphasis on stylistic and metrical perfection, for it was the Latin of an age when a speaker was judged not so much by the soundness of his arguments as for the rhetorical power of his delivery. It is the Latin of master orators, and as such, its construction is quite complex. Because so much value was placed on these rhetorical qualities, modern day Latin students find the sentence construction artificial and cumbersome. Many classics majors who had to read the Aenied loathed the experience. 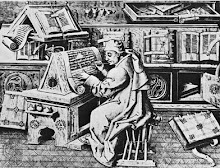 Ecclesiastical Latin, on the other hand, is the Latin of a time when the written word was of much greater importance than oratorical skill, and when the focus had shifted dramatically from the rhetorical allure of speech to the ability of language to concisely explain and defend a line of argumentation. This is the language of Aquinas, the language of scholasticism. The sentence construction is frugal, almost terse at times, and very to the point. Yet it maintains a certain rustic charm and is capable of drawing great distinctions when the need arises. A great example of the Salve Regina, a prayer that is very simple to read and translate in Latin even if you have only been studying for a brief time. Ecclesiastical Latin is a Latin that is meant to be either read studiously or intertwined with the melodies of Gregorian Chant and sung. Modern students generally find it easy to understand, with natural and predictable grammar and very few needless rhetorical flourishes. Ecclesiastical Latin is the language of a people who actually used the language to communicate important ideas and placed high value on intelligibility and utility over stylistic considerations. Yet, as I said above, those who delve into ecclesiastical Latin find that it has a very distinct stylistic charm of its own. But now we must ask ourselves this - if classical Latin developed into ecclesiastical Latin sometime at the dawn of the medieval period, and ecclesiastical Latin in turn became the form of Latin used by the Catholic Church from the dusk of antiquity until the modern day, how is it that most classical languages programs at the university level are teaching classical Latin when it is ecclesiastical Latin that has enjoyed a much longer lifespan and is in many ways still a vibrant and living force? Why have institutions of higher learning reverted to teaching a Latin that has not been spoken for almost two millenia and which was not even spoken by most Romans even in its heyday? We will look at these issues next time. A little tidbit from our friends at the Los Pequenos Pepper, a lay-run monthly periodical out of the Archdiocese of Santa Fe, where, due to the large population of Pueblo Indians, there has been an inordinate amount of "inculturation" going on liturgically for quite a long time. Here's a look at the latest nonsense going on in New Mexico. Has the Buffalo Dance been Baptized? This past January, an interfaith gathering was hosted by Monsignor Jerome Martinez y Alire, in downtown Santa Fe’s Cathedral Basilica of St. Francis of Assisi where he is rector. The event celebrated the City of Santa Fe and the Basilica’s Quad Centennial Anniversary Year of founding (1610). The evening program began with a sacred blessing dance by the Native American Santa Clara Pueblo Buffalo Dancers [pictured above] and included music from a 3-faith choir, a Sikh Community Jatha (music group), and readings from Jewish, Buddhist, Sikh, Muslim, Orthodox, Protestant, and Roman Catholic sacred texts. Did the native dancers at this interfaith event represent an ethnic Catholic variant, or were they one of the“other” religious traditions? Every August, in conjunction with the annual Santa Fe Indian Market, Archbishop Sheehan presided over the Annual Native American Mass, celebrated again at the Cathedral Basilica, featuring the Black Eagle Drummers from Jemez Pueblo. Last year, the Mass also “featured” Buffalo dancers. Two questions rise from such cultural and liturgical mixtures. 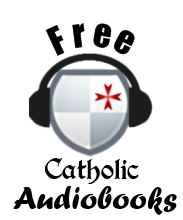 One is: do such mixtures draw people closer to the Christ and His Truth or are they merely an entertainment that does injustice to both native and Catholic spiritual practice? The other is: what can be “baptized” from another culture’s liturgical practices and what can’t? Native Spirituality or Christian Spirituality? Podles’ comments help to give us some insight into the second question, as well. The Buffalo Dancers in 2003 described their own actions – and we must take them at their word – as a prayer of thanksgiving “to the Great Spirit.” Whatever is to be said further, it must be assumed that the dancers themselves were sincere Catholics who understood deeper truths hidden within native “gestures’… thereby elevating those gestures much as St. Paul, preaching to the Athenians (Acts 17:22-32), recognized the natural piety behind an altar dedicated to “the unknown god.” Though it had been intended for pagan worship, that altar provided a means for introducing true worship. If the dancers were engaged in pagan worship or a complex ritualistic appeasement of both traditions is a matter of no small moment – and neither belongs in a Catholic church sanctuary. If they were giving true worship, however, it seems those in attendance required a good deal more explanation.